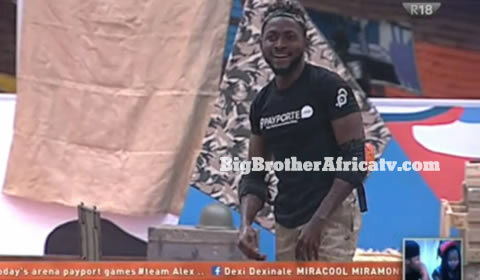 Miracle managed to bag another win in the Big Brother Naija 2018 house after by winning this week's PayPorte arena challenge. All the Housemates brought their A games but Miracle managed to slash their records and bagged himself another win. As per tradition, the Housemates were signalled to gear up and prepare for yet another competitive session in the Arena. Ever since the Friday night game prices were fired up and brought to the Million Naira mark, the Housemates have had to readjust their attitudes and redefine their game faces. Tonight wasn’t any different, looking just about ready for combat, the Housemates marched into the arena and what they were to be faced with fit the ‘survivor’ theme like a glove. While the others brought poorly picked sticks to this battle, Miracle brought out his gun and bagged one more win. The Housemates are so used to Biggie throwing mountains at them and expecting them to float. Their reactions to the military camp laid out for them was priceless. As per protocol, Biggie broke the game down and explained each challenge and what was expected of them. The first challenge was a walk in the park, literally. The Housemates were to step into each of the 5 buckets, fully immersed in the gooey contents. While most of the Housemates handled the buckets’ contents quite well, Nina and Alex looked a bit spooked. The second challenge was without a doubt the devil of all challenge as a majority of the Housemates spent a while trying dig their name cards out the mud. Anto and Bambam were sorely victimised by the challenge and consequently lost due to time having elapsed. Miracle, Rico Swavey, Khloe, Teddy A, Tobi and Cee-C managed to beat the mud blues at considerably good speeds and made their way towards the finish lines. The third and fourth challenges were quite straight forward and the Housemates swooshed their way through them with ease. Being the last on the list seems to have worked in Miracle’s favour as he managed to ‘flash-speed‘his way through the military styled obstacle course and when he realised that he was on the verge is smashing and walking all over Cee-C’s 1:41 record, he human-like slithered his way towards the target shooting range and sealed his win by depositing his name card in the metal box. A well-deserved win.